Mean old groundskeeper Jinbe has kidnapped Muddy Mole's family. Muddy sets out to rescue them all from Jinbe's army of cronies. Mole Mania is a birds-eye-view puzzle game. 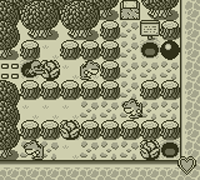 You have to guide the iron ball to the stone gate blocking the exit to the next screen, navigating past enemies and over holes in the ground. Muddy can dig underground, allowing him to bypass stone walls and enemies. Push all of the cabbages in each world into a hole to earn bonus points, and find a strange hole to teleport into a battle against Jinbe. At the end of each world you will have to fight a boss to rescue one of your children.